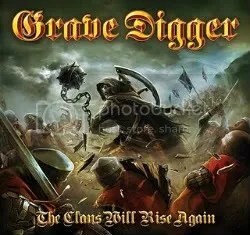 Another year, another Grave Digger release! This one is supposed to be a sequel to 1996’s Tunes of War. This album came out at the right time for me. 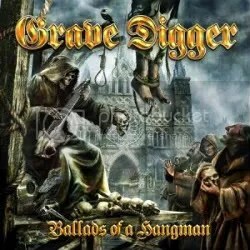 After listening to last year’s Ballads Of A Hangman just recently, I was in the mood to try out some more Grave Digger. If there was one problem I had with Ballads it’s that the songs often blended together, they were too similar to my ears. Luckily that’s not the case with The Clans Will Rise Again. I think the use of bagpipes really helps gives this album and the songs their own flavor and identity but it’s not like they’re all over the place but they help spice things up. The entire album just seems more aggressive and melodic while featuring more tempo changes than Ballads. Ballads took me a long time and many tries before I finally got into it and enjoyed it but Clans I’ve instantly liked. Just some ferocious power metal to be found all throughout. Boltendahl really comes through with some powerful and harsh vocals doing a great job but his rough voice is almost comical on some of the slower moments like when “When Rain Turns To Blood” starts off. Not really sure how you go about getting the “bonus track”. I thought it was exclusive to the digipak version but my copy came in a standard jewel case and I still have the song. Wanting to expand my horizons metallic horizons, I picked up this album in early 2010 after reading so many positive reviews for it. I’ve been familiar with the band in name only for many, many years but I guess whatever samples I would listen to online never grabbed me enough to pick up any previous albums. To be honest, I’ve spun this disc every now and again throughout the year and I’ve never been able to get into it. Not sure why because when I listened to it again recently I really enjoyed it. It’s not a great album or anything but when I’ve got 7 of the 12 songs pegged as “highlights”, I guess I would have to say it is very good. “Lonely The Innocence Dies” is a great moody ballad. “Stormrider” sounds like Judas Priest worship… Not that I’m complaining! I can easily hear Halford singing a song like that. “Pray” is a very commercial effort and more melodic affair, which caught me off guard. It almost sounds like something Ratt would do, it’s got that ’80s sleaze pop-metal kinda vibe to it. “Jailbreak” is a bonus track that comes only with the digipack version is, of course, a cover of the Thin Lizzy song. The band does a good job giving it a power metal makeover. So FINALLY after owning this album for nearly a year, I sit down, give it a few listens and I like it. Makes me want to go back and check out the band’s ’80s material.